As criticisms of president Ernest Bai Koroma’s (Photo) arbitrary and unconstitutional decision to summarily sack the country’s elected vice president yesterday continue, one of the country’s most acclaimed international lawyer – Dr. Abdulai Conteh, has strongly condemned the president. 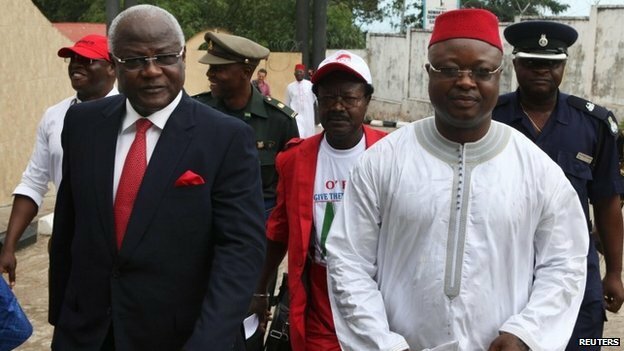 He said he could find no justification in the country’s constitution for president Koroma’s decision to relieve the vice president of his duties. He calls for the decision to be rescinded immediately. Yesterday, the vice president Sam Sumana confirmed that he has instructed his legal team to mount a legal writ in the country’s Supreme Court. 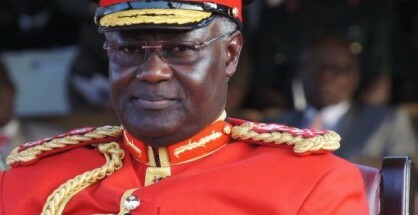 But should the president humbly listen to the growing voices of independent constitutional experts – including Dr. Abdulai Conteh, then it is likely that an expensive, futile and lengthy Court hearing, which may prove extremely embarrassing and damaging to president Koroma and his ruling APC, can be averted. Dr. Abdulai Conteh is a former foreign minister in Siaka Stevens APC government in 1977 to 1984, and also served as Attorney-General and Minister of Justice in 1987 to 1991, and First Vice-President and Minister of Rural Development in 1991 to 1992. 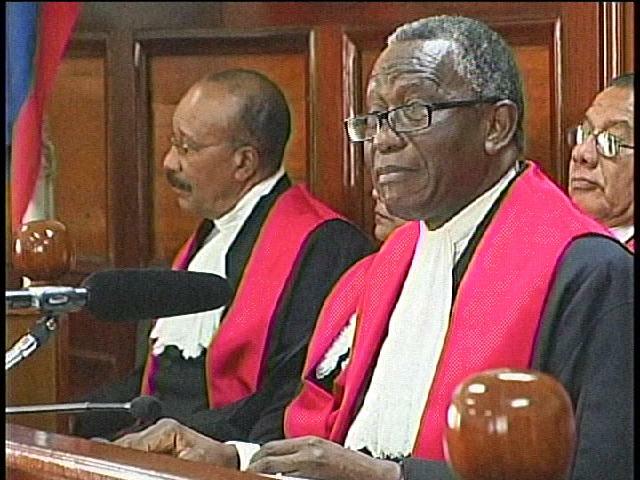 He is now an Appeal Court Judge of the Court of Appeal of the Commonwealth of The Bahamas, and is therefore more than qualified to steer president Koroma away from the brink, where his Attorney General and legal advisers have woefully failed. Please permit me to write on a matter of grave national constitutional, legal and political concern that has come to engage the attention of our compatriots both at home and abroad. I have accordingly taken the liberty to make the format of this letter an open one, as its contents address matters of public national interest. This relates to the position of the Vice President of the country. Your Excellency, up until 1991 when the current national Constitution was, after a nation-wide consultation and referendum, adopted as the Supreme Law of the land, the position of the vice president was an appointed one. This was the position after the inauguration of the republican form of government in 1971, and the introduction of a one-party form of government in 1978. The record shows that we even had the positions of First and Second Vice Presidents. But both offices were appointive and in the gift of the President as it were. The then national Constitutions (1971 and 1978) designated the Vice President to be the successor to the presidency in the event of a vacancy in the latter office. The record will also show that in 1985, just prior to the then President, the late President Siaka Stevens, demitting office, there were moves to change the constitutional and legal position regarding the succession to the presidency by the vice President. But these moves were debated and adopted in Parliament and the necessary legislation enacted. Mercifully, the country was spared any political rumpus that could have resulted from these changes so late in the day and the ill-fated Presidential Council literally proved still-born. Therefore, in order to put matters beyond conjecture, surmise and any chicanery and to make the whole process regarding the position of the vice presidency transparent, the 1991 national Constitution, for the first time, clearly made the office of the Vice Presidency, not appointive any more, but rather, an elective one. Thus, after 1st October, 1991, when the national Constitution became operational, the people of Sierra Leone stipulated and granted to themselves the right to have a say as to who shall be their vice president. The position is now covered in clear provisions of the national Constitution, namely, section 54(1), (2) and (3) of the Constitution. These provisions require that a candidate for the office of president must have a running mate designated as vice president. Together, if the slate containing the candidate for the presidency and his running mate are successful in the presidential elections; they are declared elected President and Vice President respectively. Thus, gone are the days when a President can appoint a vice President. The two offices are now conjointly elected at the same time by the will of the people, at the time of electing the presidential candidate with his running mate as the vice presidential candidate. The constitutional provisions on removal from office of either office holder, are, I dare say, clearly stated in section 51 of the national Constitution. It is no doubt instructive to note that there are no separate and particular provisions for the removal of the vice President, but rather, in the event there is a need to remove, the same provisions applicable in the case of the President himself will come into play. Your Excellency, I note with particular care the reasons given in a Release from your office dated 17th March, 2015, for removing the current holder of the office of Vice President. ii) your taking note of the fact that on Saturday, March 14, 2015, the vice President sought asylum from a foreign embassy, which the Release states is indicative of “a willingness to abandon his duties and office as Vice President…” These are matters now in the public domain and it is not intended to debate them here. But the simple and irrefutable fact is that they do not and cannot, in the face of the clear constitutional provisions, provide, with the utmost respect, the warrant or legal basis “for relieving with immediate effect” the Vice President from office. Your Excellency, with the utmost respect, as the guardian of the Constitution, as stipulated in sub-section (3) of section 40 of the Constitution, you have not been properly advised or served in terms of the provisions of the Constitution you have invoked for taking this most extraordinary measure. Your Excellency refers to sections 40 (1) and 41 (b) of the national Constitution, as warrant for the measure you have taken. First, section 40 (1) proclaims you as the President of the Republic to be the Head of State, the supreme executive authority of the Republic and Commander-in Chief of the Armed Forces. It may be noted that this section vests or grants no power, it is merely declaratory of the attributes or incidence of the office of the President. However, Part II of the Constitution on Executive Powers, in section 56(1) vests executive power in you as the President. This power may be exercised by you directly or through members of the Cabinet, Ministers, Deputy Ministers or public officers subordinate to you. But importantly, the exercise of executive power is expressly subject to the provisions of the Constitution. In plain terms, this means that executive power, whatever it may mean or import cannot lawfully be exercised in disregard of the provisions of the Constitution. Executive power is nowhere defined in the Constitution. But the Constitution does clearly provide for the removal of the vice President from office and how this should be done. This clearly puts the issue of the removal from office of the Vice President beyond the exercise of executive power, and cannot, on any view, be subsumed under it. In short, Your Excellency, neither you nor the Vice President can lawfully be removed from office except as provided for in sections 50 and 51 of the Constitution. Permit me therefore, to say, and please believe me when I say that it pains me to say so, that the removal from office of the Vice President, as stated in the Release from your office, is nothing short of an exercise of power that can find no validation in the text of our national Constitution. The second justification provided in the Release for removing the Vice President from office is a reference to section 41(b) of the Constitution. It is when section 54 of the Constitution on the Vice Presidency is read along with section 41 (b) that membership of a political party becomes an important qualification for an election to (a) the office of the President and (b) to be a candidate for the office of Vice President. Needless to say since 2007 and certainly since 2012, neither you nor the Vice President is running for election or is a candidate for election to your respective offices. Your successive election to your respective offices is now a matter of history. Therefore, reliance on the expulsion of the Vice President from the APC as a warrant for his removal from office, can find no justification in the textual provisions of the Constitution. Membership of a political party is a qualification for election to the office, but nowhere is it stated in the Constitution that membership or continuing membership is a necessary qualification for or coterminous with continuing or remaining in office. I end by saying that this is not the time for political diversions or brinkmanship. In the midst of fighting the devastating scourge of the Ebola virus which is set to bring our dear country and our neighbours to ruination, we should all strive as Team Sierra Leone, to beat back this scourge and not dissipate scarce human and other resources and goodwill on avoidable and needless diversions. Stan, thank you for your rather frosty reply, but I understand why you would want to be very touchy about any allegations of corruption involving Dr. Conteh, yourself or someone you know personally. I am not apologetic, as Dr. Conteh was a public official in my country Sierra Leone that is now languishing at the bottom of the global human development index because of corruption. Furthermore, my allegations are far from being baseless. They are based on the fact that in 1992, I, along with 5 million people in Sierra Leone listened to the SLBS radio broadcast, with awe and gaping mouths, when the NPRC government announced the names of several ministers and public officials they found to have misappropriated hundreds of millions of dollars in public funds. One of those listed was Dr. Abdulai Conteh, whose assets were then confiscated by the authorities. This information is on public record and a matter for and of public interest. So you can insult me as much as you like, it will not change that fact. As a tax payer and citizen of Sierra Leone, I have every right to hold former and present government officials, including Dr. Conteh to account, without the encumbrance of any statutory time limitations or otherwise. And I am sure, the Dr, Conteh on whose behalf you are here purporting to write, welcomes the principle of accountability. And he is aware of the fact that this allegation is highly prevalent among millions of Sierra Leoneans. But if what you are now doing on behalf of Dr. Conteh is to attempt to set the record straight, so that millions of Sierra Leoneans can once and for all decide for themselves whether Dr. Conteh had misappropriated public funds or not, then I welcome your reply to my comment, which will no doubt add to the debate and hopefully help to unravel the truth. Perhaps Dr. Conteh, yourself or anyone acting on his behalf should publish for all to see, any subsequent government or court information that shows Dr. Conteh not to have misappropriated public funds, and also that he fully accounted for the source of the millions of dollars that he used in constructing his mansion at Juba. This will then put to bed once and for all, these so called ‘allegations’ about such a brilliant son of the soil. Did Dr. Conteh misappropriate public funds in Sierra Leone which he then used for also constructing that massive chinese wall surrounding his mansion, values at millions of dollars, when at the time citizens were going to bed hungry? Many Sierra Leoneans believe that he did, based on available public record published by SLBS in 1992. Millions of Sierra Leoneans find it very difficult to understand how a public official could have afforded millions of dollars based on their meagre salary, to build such mansion without dipping their hands into public funds. Perhaps Dr. Conteh can now set the record straight. PLEASE. I rest my case. But please do not throw insults or shoot the messenger. I am just a poor Sierra Leonean who feels embittered at the destruction of our country by corrupt officials. Thank you sir – leh we change salone for we pikin dem, if not for we sef. Mr. Francis, with all due respect and dignities to you, I believed that you have no surviving relatives in that country today, and therefore you care but less. Please, you have to search your soul. Think twice, because our people are suffering. We don’t need another civil war any more, please!!! During the time of late Siaka P. Steven’s there was a one party state. We are now in a Democracy, ok! So, do not kill our people again over there. Thank you. What a masterpiece stroke of the pen, even though it came from a man who was an architect of the woes and miseries befalling our country. The learned doctor and his previous partners in crime, during their tenure of office, allow the late Siaka Stevens to manipulate and ruin the country, which the doctor now so dishonestly refer to as ‘our beloved country’. When Siaka Stevens finally got tired of using the doctors (PhD holders), he handed them over to an half-baked former army officer – the late Joseph Saidu Momoh. It was in the presence of Dr. Abdulai O Conteh that the parliamentary Bill which brought Momoh to power was legislated. I strongly believed then that a secret meeting was held between the doctor and his cohorts, before the Bill was introduced in parliament. There was great expectation for Dr. Conteh to have used his sharp pen to oppose not only such a move, but the way the affairs of the country were handled at the time. History has a habit of exposing dishonesty and wickedness. Had it been that Dr. Conteh used his education and allowed his conscience to guide him, today he would have been respected as a national hero and Guardian of our constitution. It is a lesson to all those who think they will use Sierra Leone as a milking cow to enhance their desire to enrich themselves. Those people will not be allowed to take the moral high ground, nor will their children, as we have seen what is happening. Alimamay Bundu, how and why is Dr. Conteh an “architect of the woes and miseries befalling our country”? You claimed that Dr. Conteh “allowed the late Siaka Stevens to manipulate and ruin the country” and you believe that a “secret meeting was held between the doctor and his cohorts, before a bill was introduced in parliament”. Is this belief based on fact or is it simply whimsical nonsense coming from you? See Francis Baldwin Deen’s comments below – Dr. Conteh was sacked by Siaka Stevens because he did not allow the former President Stevens to take an unjust executive action. You see, a downside of the worldwide web is having idiots like you purporting baseless accusations and tarnishing people’s reputations from careless comments that are based on fallacies. 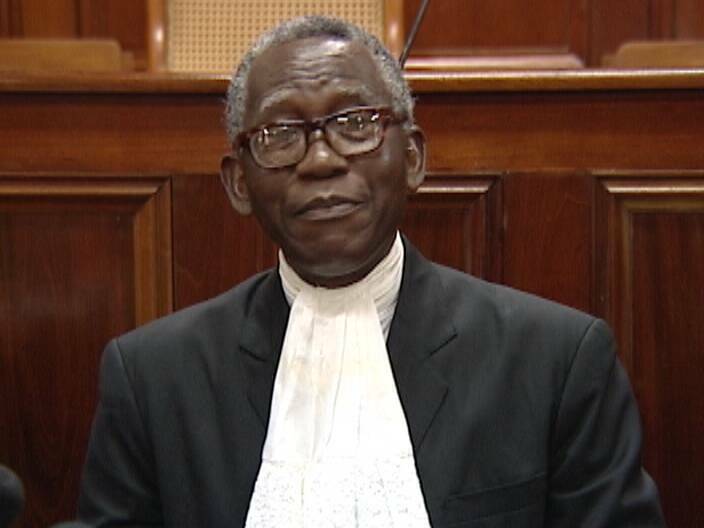 If the so called Supreme Court, whose jurisdiction this case will end up for constitutional opinion,can handle it within the full framework of its independence, Sierra Leoneans will be somehow proud again of that body. But alas, with the APC’s calculation to speedily unconstitutionally remove the elected VP, knowing that it will be contested at the Supreme court where they can influence its outcome instead of the normal constitutional procedure via parliament. If APC is really a reformed party, they should allow dissenting views on this issue from within. This issue borders on our sacred constitution, which the president swore to protect. To act ultra vires, the constitution is by itself impeachable, and like Dr Conteh said so eloquently, at a time when we should be concentrating on a common enemy – Ebola, this president is obsessed with consolidating power, thereby neglecting his duty himself. My own call is for all fellow compatriots to stand up for the sanctity of the constitution by protesting against the president’s decision. Dr. Conteh thank you very much for your invaluable contribution to this vexing debate. You are absolutely right to call president Koroma’s dictatorship for what it is. But may I turn to you Sir. Most of us in Salone remember you as the guy whose assets were frozen by the State because of corruption, and all of those assets were then at the wave of your friend’s hand in the APC government, handed over to you without due process of the law. As most Sierra Leoneans remember you as someone found by a government of Sierra Leone to be involved in serious corruption, do you not feel you should hand over back those assets to the people of Sierra Leone? By doing so, you would truly show us in salone that even if there is some element of doubt about your involvement in corruption in salone, you would have removed those doubts by relinquishing those assets back to where they belong – the people of Salone. You see, the problem most of us have in trying to take you seriously when you give legal advice about due process and constitutionality is that you have not proven to the people how you came about so much wealth during your days as minister in the APC government of Stevens. Another thing sir, please when we have this kind of constitutional crisis in our country, please step in before the train leaves the station, and dont wait until it has crashed. Because by then the damage has been done. If you had stepped in when your APC started their shenanigans months ago and advised them not to even think of sacking the VP, we would not have been where we are today. Anyway thank you all the same – respect sir. But please consider the returning of the assets issue I talked about. God bless you. Abdul Karim, before you make baseless allegations against Dr. Conteh, I strongly suggest you do some research and do not purport your falsities as fact. First of all, Dr. Conteh’s assets (basically his house) were frozen as were the assets of all ministers after the coup. His house was looted, and his belongings and personal property, including the clothes and possessions of his wife and children, were stolen by soldiers and civilians alike. Several years later, after an investigation found no wrongdoing on his part, the dilapidated shell of a house (missing roof and all furnishings) was returned to him. If you have been to Juba in the past 15 years, you would have seen the sad state that his house was in. Secondly, what “wealth” are you exactly referring to? I know Dr. Conteh and his family personally, and he is far from wealthy. Trust me, it is hard for one to lose all his personal belongings and start a new life from scratch somewhere else, like he did. He fled to Banjul after the coup and got a job there as a practicing attorney. He then worked for the court in Belize and even now in his late sixties, when he should be happily retired, he is currently working as a judge in the Bahamas. If he indeed accumulated all this wealth, why would he still be working at almost 70 years old? Thirdly, when was Dr. Conteh “found by a government of Sierra Leone to be involved in serious corruption” like you claimed? No investigation found this to be true. Another lie and misinformation perpetrated by you. You, Abdul Karim, are spreading lies and your allegations are false. It’s sad to see people like yourself making all sort of baseless claims that are not supported by facts. What is Parliament and the Justice division of Sierra Leone saying. Shouting is not the answer. Dr. Conteh, thanks for the straight forward education to us all, but especially the President and his cabal of power drunks. And unfortunately, the matter is not an APC one, rather a deeply national crisis which should rally every right thinking Sierra Leonean to the defense of the constitution – the sovereign document of our country. We need to wake up as a nation and the time is now . We really care less what APC and Koroma do to Sumana at party level. But to sheepishly play with the constitution is not only insulting, but ridiculous and baneful. Dr. Abdulai Conteh was also Finance Minister under Siaka Stevens. He is on record as the only Finance Minister to have been sacked by Stevens, before he could even read his already prepared budget speech in parliament. For him, this must be de javu all over again, as he was removed along with 4 others, Dr Sama Banya I believe, for refusing to allow Siaka Stevens to sidestep S.I. 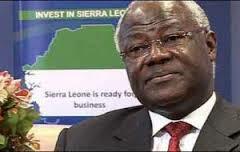 Koroma (the VP) in favour of Major Momoh.